Teeth that function properly are essential for optimal nutrition. Without healthy teeth you cannot properly chew your food for digestion. Dentures that rest on tissue are far less efficient for chewing than natural teeth and implants. When you can’t chew your food properly, your diet becomes severely limited to soft foods or liquids. These types of foods are likely have more calories. Improper diets can lead to obesity and systemic diseases like diabetes, cardiovascular disease and cancer. Bacteria from the mouth can easily enter the blood stream. There is a definite correlation between your oral health and your general health. Sometimes evidence of systemic problems show up in the mouth first. Regular oral hygiene visits and examinations can help protect you from the ravages of systemic disease. Your smile speaks to others about your disposition, your feelings of self-worth, and the value you place on personal appearance. An unattractive smile can bestow an image that might be contrary to your actual nature by making you appear austere or frowning. It can give you the image of a derelict or a hillbilly even if you are actually an extraordinary success. Many people who are embarrassed to smile withdraw as if their social lives and careers were sabotaged. An attractive smile is a critical ingredient for success and self-esteem; and it is every bit as important as expensive clothing or fine jewelry. A nice smile communicates confidence, attractiveness and friendliness. “I would like to thank Dr. Feinberg for giving me my life back and most of all—I have no fear when I sit in a dental chair. The reason why my fear is gone is that Dr. Feinberg gives one-on-one care…I can smile, talk and be with people and not be ashamed of what my teeth look like. And I can eat with comfort with a full set of teeth! I am the happiest because there were no implants or surgery. 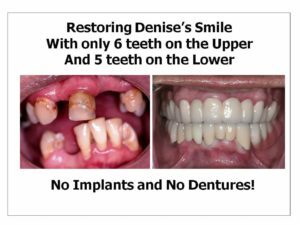 I was told by a dentist that implants or dentures were my only options. Dr. Feinberg’s concern is to save the patient from any discomfort that is unnecessary—he has a passion for his dentistry and mostly for the patient. He saves hopeless teeth and I am living proof! 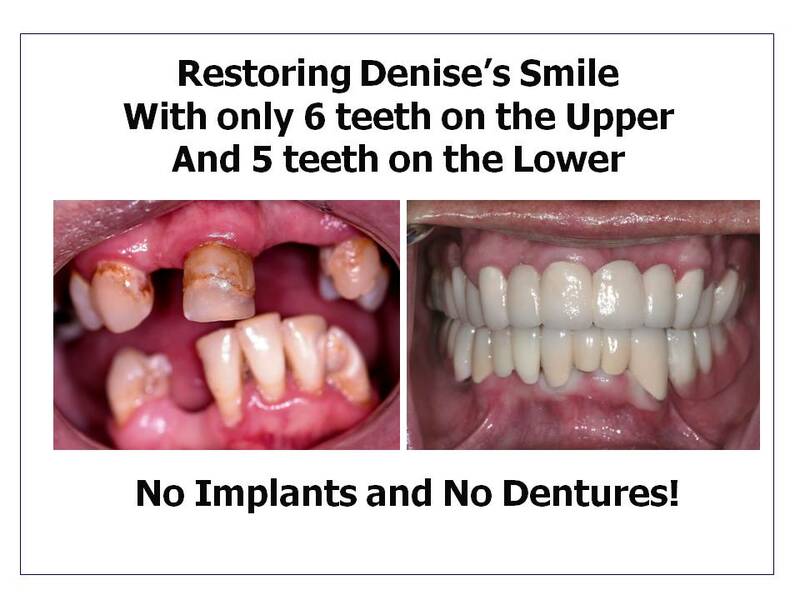 Dr. Feinberg told me that my homework assignment is to smile a lot and that is all I do.” –Denise F.